I’m making some assorted comics for Unbound Equity project. These are sort of hit or miss, to be honest. I’m hoping making comics will help me think about issues of equity and access in different ways, and add a little variety to the conversation stream. The following comic is the best of the bunch from the last few days, I think. I was watching a Twitter Scavenger Hunt unfold in the #unboundeq hashtag (people were sharing mystery photos and others were guessing items), and I thought about someone misunderstanding the directions, and searching for Twitter itself. Particularly since so many people think Twitter has lost its original concept in this age of disinformation and hate. 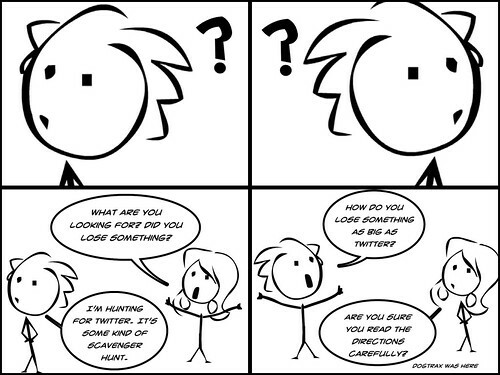 And this following comic came from me wondering about how we interact with people in places like Twitter, where personality is often understood through words alone. While this can be powerful, from a writing standpoint, it can also lead to misinterpretation. The last line is a nod to my six-word-bio I have pinned on Twitter. 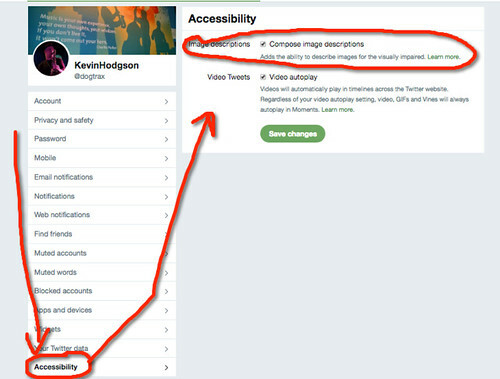 And then, there has been a conversation going on about using the alt-text feature of Twitter for photos — so that blind and/or disabled readers can still engage in the conversations (alt-text is read aloud by screen readers.) In Twitter, you have to turn the feature on. Which makes no sense to me at all. (In Mastodon, it is a default feature). 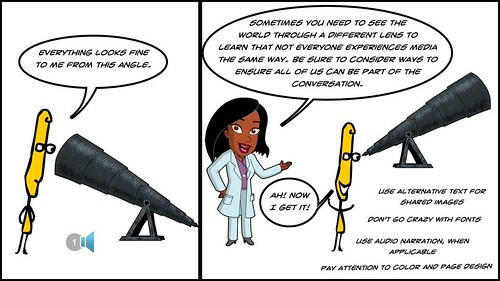 This comic didn’t work as I wanted it to — the telescope was supposed to be a metaphor for narrow vision turned around into a wider understanding of the world. It came across as too preachy. The version I shared on Twitter was a video format, with audio voice (since one of my suggestions was to use audio for content). 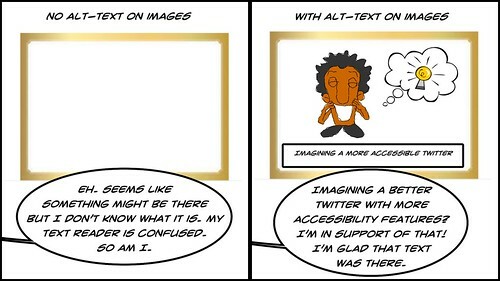 Ironically, by making the comic a video, I was unable to add alt-text to it. 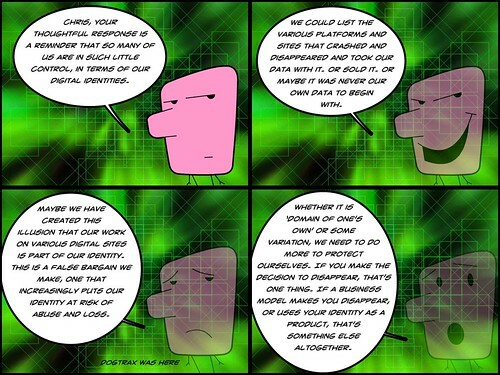 Finally, this comic is a response by Chris to another comic (about identity). The thread moved into technology platforms disappearing, and what happens to our data and our digital identity when that happens. Three weeks in and my sixth graders are already writing up a storm. We’ve done a short story prompt (using a map of imaginary land as setting for an adventure); explored characters in a short story read-aloud with evidence from the text; designed a treehouse in their writing notebooks; and now are working on sharing and explaining their aspirations for life in our Dream Scene project. We’ve composed with media on the computers and doodled in the margins of text on paper. I like to come out of the gate with a lot of different kinds of writing. This allows them to enter as writers from various directions — not everyone loves open response analytical writing, not everyone loves writing fiction — and allows me to get a glimpse of where they are at with skills and imagination and basic writing skills. Some of my young writers are already amazing me with their skills. Others, they are already worrying me, too. My role is try to help my students at both sides of that spectrum, as well as those in the middle, to move forward and make progress, and find joy in the act of writing. And so the year begins. 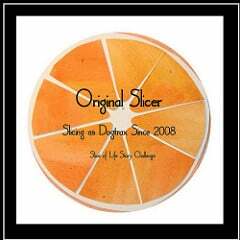 The Dot Day Collaboration is now closed. Thanks to everyone who submitted a dot or an idea and all that. The final canvas looks pretty cool. This collection of stories, poems, visual art and letters to children is a powerful antidote to the times we are living in. 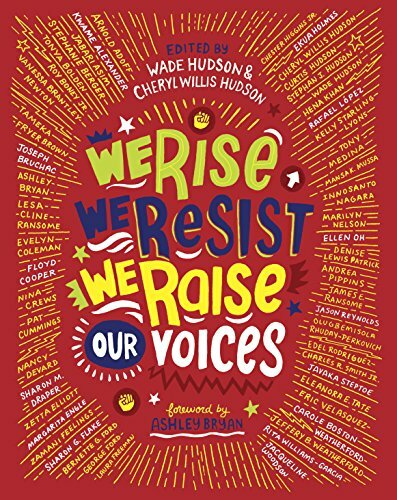 We Rise, We Resist, We Raise Our Voices, edited by Wade Hudson and Cheryl Willis Hudson, features work by more than 50 gifted authors and illustrators and the collection has clear and powerful messages for young readers and children: Don’t be frightened of the current political system — help make the future a better place for all of us as others have done in the past — we adults are here for you when things get difficult. I have to admit, I was both encouraged and worried about the overt political message of this collection. From the opening page, this is, as the title says, a book of resistance. I was encouraged because I know many children need a path forward through these dark times, particularly those young people who are the targets of racism and immigration policies and who, if not the target, worry about those messages on others. I was worried because this book is so anti-Trump, it would be difficult for many educators to make the decision to bring this into the classroom, where balance is often requires. Although, to be fair, that “balance” is a likely a controversial statement. No classroom is fair and balanced in its politics. The classroom culture is shaped by students, and by the teacher guiding the conversations. A classroom is impacted by the larger school, which is impacted by the larger community culture of the town or city in which is sits. So, as I read We Rise, We Resist, We Raise Our Voices, I kept shaking my head in agreement and reading further into each new story or poem or letter or reflection, feeling my heart beat to the words on the page, and I kept wondering: how can I bring pieces of this powerful text into the classroom? How can I work into my classroom Kwame Alexander’s poem, A Thousand Winters, about how to keep a young black daughter safe; or Ellen Oh’s Words Have Power about first and second generation American immigrants and the discrimination they face as they hold on to their culture; or Jacqueline Woodson’s amazing Kindness is a Choice, which is about what it says it is about; or Tony Medina’s short story One Day Papi Drove Me to School about separation of family from the viewpoint of a child; or Hena Khan’s How to Pass the Test when anti-Muslim fervor hits the playground. How? Oh, I’ll find a way. You should, too. 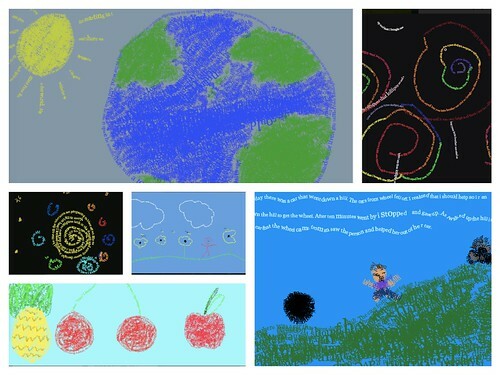 I’ve written about this project before, where my sixth graders write short Circle Stories (with a circular theme or featuring a circular object) and the “paint” on a digital canvas with their words, transforming stories into art. We had another successful Dot Day yesterday, and some of the stories made visual are evocative and creative. This collage is just a few of the Dot Day Circle Stories that I found intriguing. … questions of equity issues such as equity in web representation, digital colonialism, safety and security risks on the web, and how these differ across contexts. Yesterday, I shared a comic and thoughts on how difficult it is to forge our own identities. 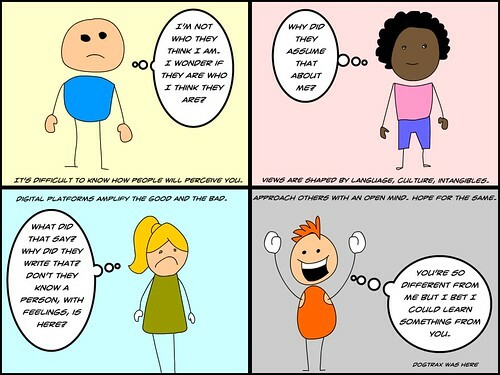 Today, I have a comic (above) thinking on how others views impacts how we see ourselves. The last frame/box is the most important of the comic. While it is easy to fall these days into the traps of negativity, I remain hopeful of the possibilities of networked digital spaces to expand not just notions of others, but also some semblance of kindness. I used kid characters in this comic for purposeful effect — to remember that this world we are in now contain the seeds of the world our children and our young students (I teach in an elementary school) are growing up in. We have an obligation to make it better than it is, for them as much for us. One of the topics of the first week is to think about the nature of identity. I’ve done regular mulling on this topic of digital identities before and continue to be intrigued by the way we are perceived and the ways we project ourselves through networks and platforms. In my classroom with sixth graders (11 year olds), we have discussions about this in relation to creating avatars for online spaces and gaming platforms. What do your choices about your avatar say about you? About what you want others to think about you? In some ways, we have the possibility to create new identities or to build off existing interests, to find groups with our interests (that long tail effect) and use identity to connect. In other ways, once we project ourselves into the world, we relinquish (sometimes, rather reluctantly) some authority over that identity since we lose the human interaction (facial expressions, hand movements, emotional reactions) that plays such a large role in the ways we understand another. This tension sits at the heart of the possibility and the problems of engaging in online discussions with others. 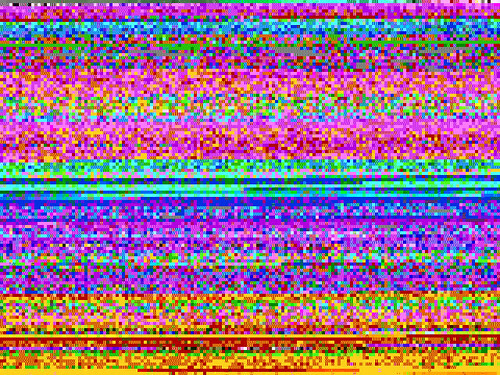 See more posts in the Identity tag here at my blog from over the years. So, I am thinking I might do some webcomics for this Equity Unbound course as much as possible, as another way for me think about different issues. 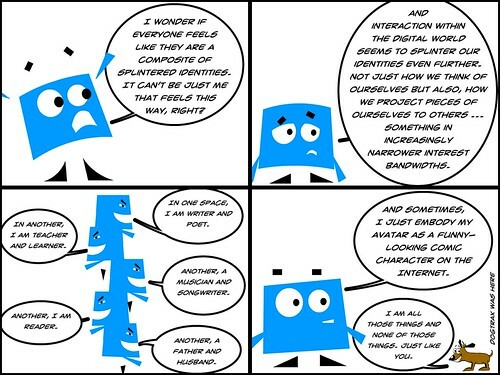 I created the comic above as I was pondering this question of how our digital interactions are often two sides of our identity — sometimes on purpose and sometimes, not.